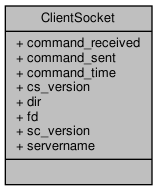 Basic support for socket communications, including the file descriptor, input buffer, server, server, version, etc. ClientSocket could probably hold more of the global values - it could probably hold most all socket/communication related values instead of globals. Definition at line 119 of file client.h. Definition at line 123 of file client.h. Referenced by CompleteCmd(), reset_vars_common(), script_process_cmd(), and send_command(). Definition at line 128 of file client.h. Referenced by CompleteCmd(), and reset_vars_common(). Definition at line 121 of file client.h. Referenced by client_negotiate(), send_command(), and VersionCmd(). Definition at line 120 of file client.h. Referenced by add_character_to_account(), client_connect(), client_disconnect(), client_is_connected(), client_mapsize(), client_negotiate(), client_run(), client_send_apply(), client_send_examine(), client_send_move(), cmd_raw(), command_take(), create_character_window_show(), create_new_character(), do_account_change(), do_account_create(), do_account_login(), get_image_info(), get_new_char_info(), inscribe_magical_scroll(), look_at(), metaserver_connect_to(), play_character(), read_config_dialog(), ReplyInfoCmd(), requestface(), script_process_cmd(), send_command(), send_create_player_to_server(), send_mark_obj(), send_reply(), SendAddMe(), SendVersion(), SetupCmd(), SockList_ReadPacket(), and toggle_locked(). Referenced by client_negotiate(), draw_stats(), set_item_values(), and VersionCmd(). Definition at line 131 of file client.h. Referenced by client_connect(), keybindings_init(), save_keys(), and script_init().